The new S HOTEL JAMAICA made its splashy debut in Montego Bay with forward thinking design and a modern take on Jamaican hospitality, putting the resort city back on the map among international travelers. S Hotel’s prime location on famed Doctor’s Cave beach and the irie Hip Strip, serves as a stylish basecamp to explore the area’s new shops, restaurants and entertainment. 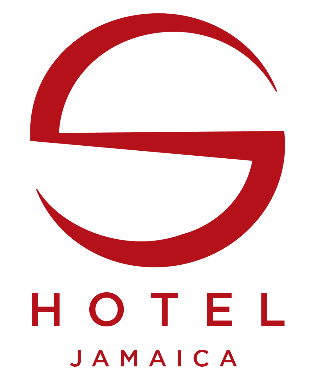 The inspiration for the contemporary 120-room S Hotel is as cosmopolitan as it comes, but the feeling is notably Jamaican as the hotel welcomes guests to their home away from home, balancing a cozy atmosphere with its purposeful design and sophisticated amenities. Buzzing bars, a high-spirited pool scene, the exclusive Sky Deck for concierge floor guests, international restaurants, a café, a spa with therapeutic plunge pools, a gym and spacious modern guest rooms, thoughtfully combine to create a modern and effervescent sense of place. 1 minute walk to Hip Strip - In addition to checking out the natural beauty of this port city, Montego Bay offers a plethora of attractions and entertainment options as the best waterfront dining spots, reggae clubs and Rastafarian art galleries, to gaming lounges and endless tax-free shopping. LOBBY BAR; the hotel’s intimate and central meeting spot serves a custom selection of wines, beers, Champagnes and a full range of specialty house-made local elixirs. ROCK STEADY; The hotel’s premier restaurant is open daily for lunch and dinner featuring artisanal Jamaican and international cuisine. The menu features regional ingredients and produce in a wide variety of innovative, locally inspired dishes served in a stylish setting. THE MARKET; the hotel’s more casual eatery serves breakfast featuring a fresh locally driven buffet and a la carte options highlighting Caribbean and international specialties. Indoor and al fresco seating available overlooking the main pool. SKA CAFÉ; Start your day, afternoon or night right with your favorite cup of java, fresh juice or light bites at The Ska Café, which features indoor and outdoor seating overlooking the pool, and a library with an international array of magazines, books and newspapers. POOL BAR & GRILL; Your go-to while soaking up the sun by the pool. The bar uses top-shelf spirits to design inventive craft cocktails and straight-up classics, while a lunch menu boasts tasty, healthy snacks, made-to-order sandwiches, pizza, grilled specialties, salads, and fresh juices. SKY DECK BAR; Exclusive to Sky Club Suite guests, this bar located on the 5th floor rooftop serves modern cocktails, an extensive wine list, a decadent tapas menu and is the ideal spot to enjoy the sunset. WET DECK; with an international ambiance reminiscent of the Mediterranean accented by an irie vibe, the vast Swimming Pool will be framed by lounge-worthy swim-out cabanas, so guests can take center stage. DOCTOR’S CAVE BEACH is one of Jamaica’s most famous beaches once believed to have therapeutic powers. S Hotel has privileged access to this gorgeous beach right from the main pool with a dedicated area just for our guests. SKY DECK; this rooftop bar, lounge and pool are exclusive to Sky Club Suite guests only, located on floors 5 and 6. Boasting enviable views over Doctors Cave Beach with a glass enclosed pool surrounded by cabanas and loungers; this is the ideal spot for sunset to enjoy modern cocktails and a decadent tapas menu for refined revelry. THE SALON offers hair styling services, manicures and pedicures with polish by Deborah Lippmann and Lycon waxing services. THE GYM offers state-of-the-art equipment from elliptical machines, treadmills, free weights and more. MEETINGS & EVENTS spaces and services providing a unique combination of intimate settings for board meetings, corporate training, unforgettable weddings, and other special events. The 120 rooms feature sleek interiors with an overarching monochromatic color scheme with gorgeous views of the Caribbean Sea or the lively Hip Strip, while oversized “wicker” wrapped soaking tubs are a focal point of the Spa Suites. The hotel’s signature Sky Suite soars above the property with 20-foot ceilings while the Presidential Suite features three bedrooms and a living/dining room. All rooms feature the following: Air conditioning, Direct-dial phone, Complimentary WiFi, Multi-plug USB connection device, Satellite TV, Safe deposit box, iron/ironing board, Minibar/Coffee maker, Complimentary water, Hair dryer.